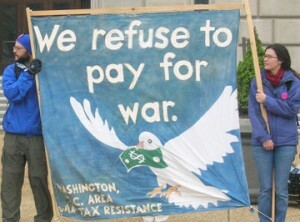 The National War Tax Resistance Coordinating Committee (NWTRCC) is a coalition of groups from across the U.S., formed in 1982 to provide information and support to people involved in or considering some form of war tax resistance (WTR). Affiliate organizations and individual supporters are joined together in a common struggle for a more just and peaceful society. We oppose militarism and war and refuse to complicitly participate in the tax system which supports such violence. NWTRCC sees poverty, racism, sexism, homophobia, economic exploitation, environmental destruction and militarization of law enforcement as integrally linked with the militarism which we abhor. Through the redirection of our tax dollars NWTRCC members contribute directly to the struggle for peace and justice for all. NWTRCC promotes war tax resistance within the context of a broad range of nonviolent strategies for social change, and is firmly embedded in the peace movement. NWTRCC’s goal is to maintain and build a national movement of conscientious objectors to military taxes by supporting, coordinating and publicizing the WTR actions of groups and individuals. These actions include: war tax resistance, protest, and refusal; the redirection of military taxes to meet human needs; support of the U.S. Peace Tax Fund Bill and adjustment of lifestyle to avoid tax liability. WTR actions are undertaken in accordance with each individual’s moral, religious or political conscience, and with the hope that such actions will contribute to a change in the priorities and policies of the U.S. government. Recruiting for, maintaining, and distributing an updated National Network List of affiliate groups, alternative funds, contact persons, and counselors. Publishing and distributing, both online and in print, resources on WTR history, methods, and consequences. Publishing a periodic newsletter on WTR, with a specific focus on WTR organizing. Providing WTR counselor information and periodic trainings. Coordinating and publicizing WTR campaigns and events. Providing technical assistance on WTR organizing. Providing introductory information to groups and individuals who request it. Organizing regular national meetings for those involved in and/or supportive of WTR. Participating whenever possible in international gatherings of conscientious objectors to military taxes.